Part of the body's natural aging process involves the slowing of collagen and elastin production in the skin. The result is more visible wrinkles, lines, and creases, as well as loose skin on the chin, neck, and jowls. To combat these signs of aging, Plano Aesthetics offers FaceTite. This revolutionary minimally invasive procedure, recommended by Dr. Jeffrey Caruth, uses radiofrequency-assisted lipolysis to heat up and dislodge fat cells, causing the skin to tighten and allowing collagen to be produced at a much faster rate. When compared to SmartLipo, which stimulates the production of collagen over time, InMode FaceTite offers more immediate results. Enjoy a tighter, more youthful facial appearance and fewer wrinkles without the invasiveness and downtime associated with lifting surgeries. 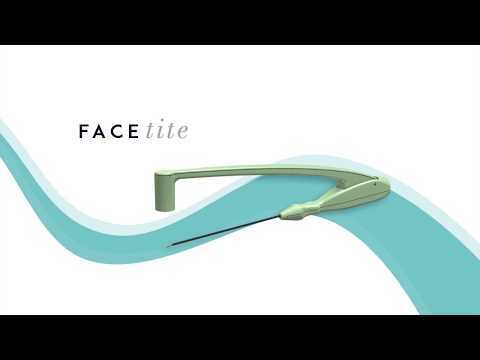 We encourage you to schedule a consultation at our Plano, TX practice to learn more about FaceTite and its benefits. For the treatment of very small facial areas including the brow, periorbital area, nasolabial fold, lower face, jowls and neck, InMode technology and Dr. Caruth are proud to offer AccuTite, a contouring tool that uses radiofrequency energy to tighten the skin and contract the tissue underneath, offering smooth, dynamic results. Very similar to FaceTite, AccuTite can be used to treat very small areas with incredible precision. FaceTite is generally used to treat loose skin on the lower face (jowls) and neck area. You are a fantastic candidate for this procedure if you're experiencing classic signs of aging and desire a boost in collagen production for tighter skin. In order to receive this treatment, you should not be pregnant. A consultation with Dr. Caruth will help you to better understand your candidacy for this procedure. This surgical aesthetic treatment uses a minimally invasive technique that involves inserting a very small cannula underneath your skin while using local anesthesia. Once the cannula is placed, the temperature can be monitored and controlled via internal and external thermometers to make sure the heat remains at a safe and effective level. The radiofrequency energy that the FaceTite device emits will be effective in disrupting fat cells, and will also cause the skin to contract, sparking an increase in collagen production. Sessions typically last around 45 minutes per treated area. After a FaceTite procedure, you will be sent home to rest for the remaining portion of the day wearing a compression garment. You should be able to return to your normal routine by the next day. It could take around three days for any redness or swelling to subside. Strenuous activities and exercises should still be avoided for around 1 – 2 weeks following the procedure. Patients will generally see some visible results immediately after their FaceTite treatment. However, since the procedure involves stimulating the collagen process, you will see more gradual improvements at around six months post-procedure. Your results will be long lasting if you maintain a healthy weight through proper diet and exercise. How much does FaceTite cost? The cost of your FaceTite session will depend on the severity of your skin laxity and the size of the treatment area. During your consultation with Dr. Caruth, your aesthetic goals and concerns can be discussed. Next, a treatment plan will be created that includes the approximate cost of your procedure. Plano Aesthetics accepts many forms of payment and can help you find low-interest financing, if necessary. InstaLift, a minimally invasive facelift technique, is perhaps one of the most effective and long-lasting treatments for lifting the midface and producing volume. During your consultation, Dr. Caruth can help you understand each of your treatment options so the appropriate procedure is chosen. Can BOTOX or fillers help? BOTOX or a dermal filler like Juvéderm can often be incorporated alongside a FaceTite procedure to attain even greater results. While the products could also offer results on their own, they will not be as lasting or drastic as those achieved during FaceTite. Usually, only one treatment is necessary. During your consultation, Dr. Caruth will assess the condition of your skin and recommend treatments that he believes will help you reach your goals. After treatment, your results will continue to improve over the coming months. While they are considered lasting, maintaining a healthy lifestyle is imperative to protecting the results of your procedure. InMode's FaceTite and AccuTite procedures are very similar in nature, offering stunning results. The primary difference between the two procedures is the size of the applicator. AccuTite is used on very small treatment areas for optimal precision. FaceTite can be used over large areas of the face and neck. Dr. Caruth will determine whether FaceTite, AccuTite, or a combination of both will best help you achieve your aesthetic goals. Surgical procedures like face and neck lifts don't have to be your only alternative for creating tighter, younger-looking skin. FaceTite and AccuTite, offered by our Plano, TX practice, can tighten skin and address a stubborn double chin. These InMode technologies use a unique radiofrequency-assisted lipolysis technique that ignites collagen and contracts the skin. Call today to schedule your consultation with Dr. Caruth at Plano Aesthetics.